As I was looking for new holiday recipes, I happened upon this one. Cheesecake. Really? Cheesecake on FMD???? I read it over, and totally did not believe it would be good. I read through comments and found most people wanted to make it. Then I got to the reviews from people who had made it. Most were positive. A couple were negative. I decided to try a half batch of the batter to see what is up. I made the necessary changes to make it fit FMD- always a challenge! It was tasty... but eggy to me. So I tried a second time. Cashews are expensive right now and I was not about to waste any! And you know what? This is it! Winner winner, cheesecake dinner. Er, not really dinner, per se, but, you get the idea! I will warn you that this is a 2 day process (or one very long day). You have to soak the cashews for 8 hours, and after the cheesecake is baked, it MUST chill in the fridge over night. I know I am torturing all of my fellow cheesecake lovers out there, but trust me- It IS worth the work and the wait!! Also- don't be put off my the cauliflower- you do not taste it at ALL! 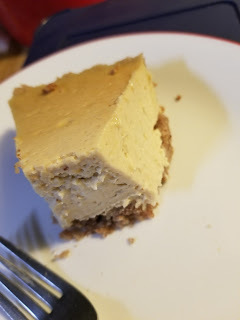 This cheesecake is tangy and has a glorious creamy mouth feel. 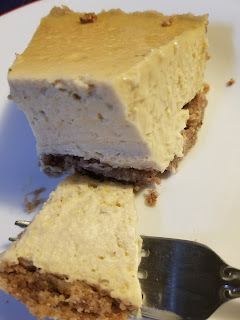 It looks like cheesecake and I would be hard pressed to tell it from a full on real dairy cheesecake! Top it with fruit or leave it plain. Pro Tip: On baking day, I highly suggest that you measure every ingredient out and put into little bowls or cups. Pretend you are on a cooking show. It will really help!! And it will save time. **** Note: I do not have subs for any ingredient, as this is how I made it. I cannot attest to how any substitutions would work out. Mix all the ingredients together, then press into the bottom of a spring form pan. You can also use a deep pie plate, or a shallow casserole dish. Set aside. You can make this on day 1, or day of baking. Day 1- Soak the cashews in filtered water for 8 hours or overnight. Rinse. Combine the water and xylitol in a sauce pan and cook over medium heat just until the xylitol is dissolved. Pour into a jar and cool. Cover and refrigerate until baking day. Grate or chop the cauliflower and add to pan. Add a half cup of water, cover and steam the cauliflower on the stove. Cook until soft and drain. Let the cauliflower cool for a few minutes, until it can be handled safely with your bare hands, and then squeeze it as dry as you possibly can (you could do this by pressing the cauliflower down a fine mesh sieve or wringing it with a tea towel). Put in fridge until baking day. Bring 3-4 cups of water to a boil. You will need this for baking the cheesecake. Rinse the cashew pieces under running cold water and add them, along with the coconut milk to the bowl of your food processor, or Vitamix. Process until real smooth and creamy, about 5 minutes for a food processor, just a minute or so for high speed blender. Add reserved cauliflower and resume processing until really smooth again. Add xylitol simple syrup, coconut oil, salt, apple cider vinegar, baking soda and vanilla and then resume processing until well combined, about 30 seconds. Throw in the lemon and orange zest and juice and mix to combine. In a large bowl, whip the eggs until foamy. Add the cashew mixture and using the wire whip, mix very well, until the mixture is silky and smooth. Add arrowroot (or tapioca) and whisk again until smooth. Pour over the reserved crust. If using a spring form pan, place the pan over a piece of aluminum foil and fold it up around the pan. You only need the foil on the bottom for a spring form pan. Cover the top tightly with foil, regardless of the pan. Now place your cake in a rimmed roasting pan, and set on your oven rack. Carefully pour some boiling water into the roasting pan so it goes to about ¼ of the way up the side of the pan. Bake for 15 minutes at 350, then decrease the temperature to 250F and bake for another 90 minutes. Check the cake- if the center is jiggly, continue to bake for 15 minutes at a time until no longer jiggly. Turn off the oven. 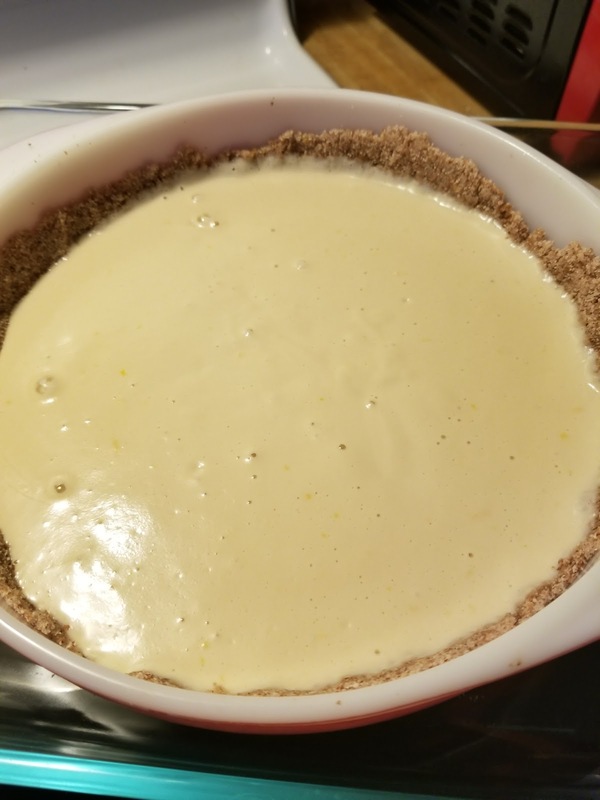 Leave the cake in the oven, undisturbed, for about 1 hour, or until cool enough to be handled with your bare hands, and then slide it out of the oven. 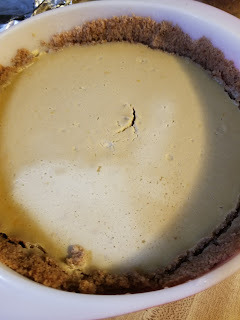 When the “cheesecake” is completely cooled, refrigerate uncovered for at least 6 hours, preferably overnight. Top with your favorite fruit or enjoy plain. The entire cheesecake is approximately 24 standard healthy fat servings. Carolyn - I got a bit confused .... you are to bake this covered with foil the entire period? Can I sub coconut sugar for xylitol? I actually didn't use a spring form pan. I used a casserole dish. Can I use a different flour if I am out of almond meal? Is almond meal the same as almond flour? Almond meal and almond flour are generally the same thing. I have not used any other flour, so I cannot speak to how another flour would work. If you choose a grain, it changes the portions. the first part of the directions tell you to soak the cashews and then rinse. Add water to xylitol. How much water?